Rebeca Monzo, 8 February 2015 — After reading an article from the January 31, 2015 issue of the newspaper Granma about Cuba and the United Nations Development Program (UNDP) entitled “Cooperation Leads the Way,” a ton of questions came to mind about the subject at hand. It has been forty years since a UNDP office was established in our country with the objective to collaborate with the island’s government on the promotion of social development and public well-being. From my meager understanding, the only party to have benefited from this has been the government itself, especially in terms of the favorable publicity it has received. They make up a negligible part of the population but the Cubans who work for this and other UN organizations are paid in CUC (Cuban convertible peso), which surpass by leaps and bounds the highest salaries of the most qualified professionals in our society, who are paid in CUP (Cuban pesos). According to the aforementioned article, Granma “chatted” with Mrs. Jessica Faieta, Director of the UNDP Regional Bureau for Latin America and the Caribbean as well as the Assistant Secretary-General of the UN, who discussed the improvement of the quality of life of our citizens. She recognized the efforts of the Cuban government in regards to food security and the strengthening of the agricultural and non-agricultural cooperatives, pointing out, in addition, that the Cuban healthcare system has been strengthened. With all due respect, it strikes me that this official had only a limited view of the situation, as is the case with everyone who visits us. Guests are taken only to those organizations that have been prepared in advance by the government and which serve as “display windows” for foreigners. Perhaps if she had to depend on the ration book for a while or to seek medical help at one of our clinics — those used by the average citizen — it is quite possible she might think differently. I do not understand how UNDP, based in our country for four decades, has not been given the task of investigating on their own — in closer contact with the population — to verify the “wonderful statistics” provided by the government, which does not at all reflect our reality. One need only take a stroll through Central Havana, Old Havana (provided one ventures beyond the historic center), Cerro, Tenth of October Arroyo Naranjo, San Miguel del Padron and even Vedadao and other neighborhhoods to see the poor sanitation conditions and overcrowding in which the Cuban people must live. and the lack of specialists in our health centers, for being these missions abroad, being replaced mostly by students, many of them foreigners. There is also the issue of a shortage of specialists in our health system due to the large number of them serving abroad in medical missions. They are being replaced mainly by medical students, many of them foreigners. In terms of our society’s standard of living, it should be pointed out that the disappearance of the middle class — the very mark of a country’s wealth — has led to the emergence of an impoverished class (with equality for all) with salaries that do not cover even the most basic necessities. The contrast is made even more striking by the emergence of a leadership class with an affluent lifestyle which only accentuates the differences. However, Mrs. Faieta and I are in full agreement when it comes to the positive steps taken towards normalization of diplomatic relations between the governments of the United States of America and Cuba. Once there is a successful outcome — one hopes sooner rather than later — it will be to the benefit of all Cubans. I believe that it is time to end once and for all the blindness that until now has led the way. 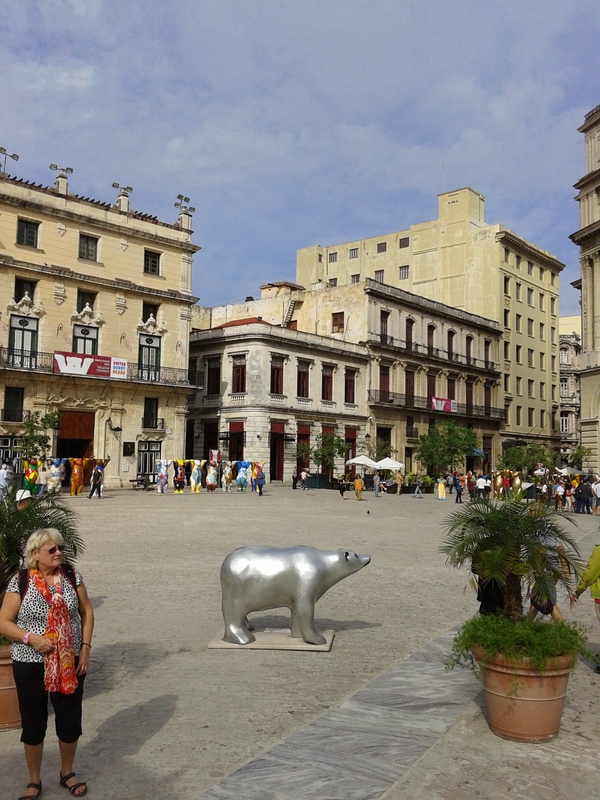 Rebeca Monzo, 23 February 2015 — In the Plaza de San Francisco in the historic center of Old Havana there is a traveling art installation, United Buddy Bear, made up of huge bears that surround the square. Each of them represents a country in the western hemisphere and they are decorated by an artist from each nation. Representing Cuba is the work of painter Nancy Torres. The exhibition is like a cry, like a hymn to tolerance, which has captured the attention of both the Cuban public and tourists alike. 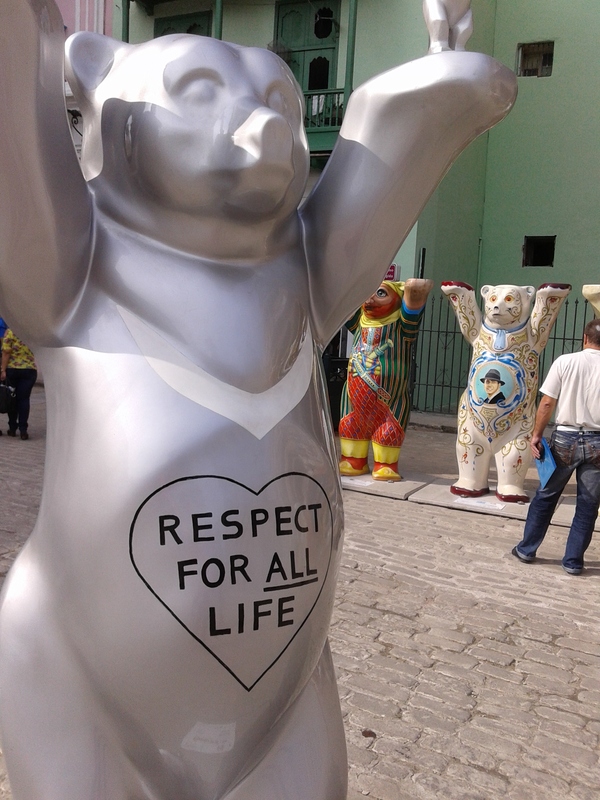 Sometimes people even line up to be photographed in front of their favorite bears, especially those of Cuba and the United States, perhaps due to the historic moment in which we now find ourselves. Besides these beautiful multi-colored artworks, a lovely bronze sculpture recently appeared in the square at the entrance to the Lonja del Comercio building. 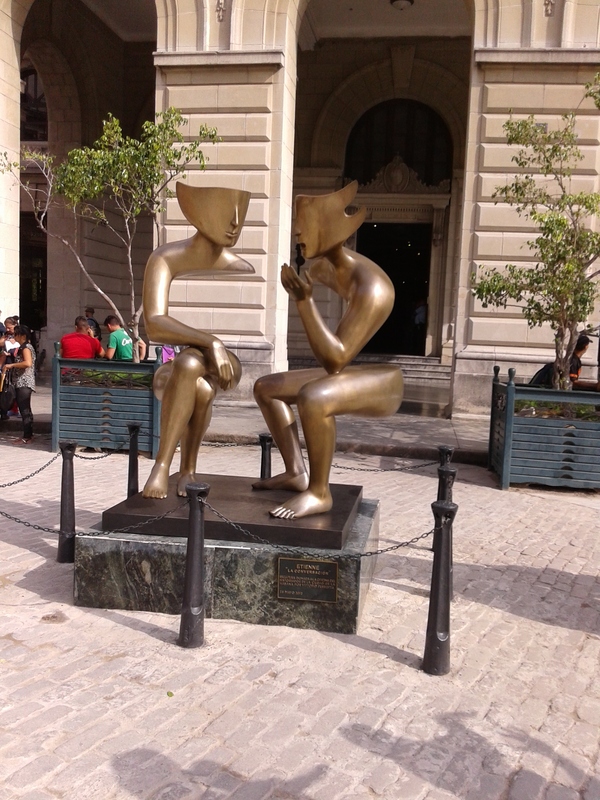 The sculptor, Vittorio Perotta, has given it a very evocative title: The Conversation.